The properties now on St Mary Street occupied by the Gym and other smaller businesses are relatively new. They were thought to have been built in the 1990’s on the site of some older buildings. The solid building on the left of the photo is now used as Shelly’s Cafe and Christopher’s Barber Shop. The tall building in the distance is the old cinema, The Picture House. The building and yard in between these two is the subject of this particular page. At the time of the 1840 Tithe Survey the property was part of Plot 154, a house and garden owned by Thomas Morgan and occupied by Samuel Witchell Lovegrove. The house was on the part of the property fronting the High Street and the part of the property facing St Mary Street appears to be garden land. We know from later indentures that there was a stable on part of the land. We don’t have a complete record of who occupied these cottages. An indenture dated 1878 lists Mary Woodward, James Collier and Elizabeth Robertson and then later Mark Williams, John Smith and someone called Bendall in the three properties. Interestingly we had initially assumed that the three houses were built in a row fronting St Mary Street, but the rate books give the extra information that one of the three houses was ‘up the Court’. The 1881 ordnance survey map shows that they were in fact set out at right angles to the street and appear to be the same building as the one behind the van in the above photo. The 1851 census shows that Mary Woodward, Thomas Collier and Elizabeth Robertson were living there at that time. Mary Woodward – the 1851 census shows that Mary was a widow aged 68 ? (difficult to read) but born in Thornbury living with her son, Benjamin a brickmaker’s labourer aged 19 and George an agricultural labourer aged 16, both born in St Helier, Jersey. Although young George was born in St Helier he may have been baptised in Thornbury as there is the baptism of George Woodward on 9th May 1838 who was aged 4. His parents were William Woodward, a labourer and his wife, Mary. They were living in the Poorhouse at the time of the baptism. The 1861 census shows that Mary Woodward was still living there. She was then a hawker aged 70 living with her son George who was an agricultural labourer. Mary was mentioned as a tenant of the cottages in the will of the owner Thomas Morgan in 1869. It is possible that Mary may have died in April 1870 aged 77. The 1891 census shows George Woodward was lodging with William Cook at 2 Upper Bath Road. The 1901 census shows George aged 63, still a single man and a general labourer, was a pauper in the workhouse in Thornbury. Thomas Collier – although it was ‘James Collier’ whose name is mentioned in the indentures, the 1851 census lists the occupant as Thomas Collier. Thomas was a brickmaker’s labourer aged 25 from Hill living with his wife, Mary Ann aged 23 from Littleton, and their children Henry aged 6 and George aged 3 both born in Kington and Emma aged 4 months born in Thornbury. They had at least children born in Thornbury: Henry Thomas was baptised on 23rd March 1845, George baptised on 10th October 1847 and Emma baptised on 12th May 1850. By 1861 Thomas and the family had move to live in Pullins Green, Oldbury. By this time they had had three more children; Louis was aged 8, John aged 5 (born in Tidenham) and Susannah aged 1 born in Thornbury. Elizabeth Robertson – in the 1851 census Elizabeth was a widowed charwoman aged 75 born in Thornbury. According to Scribes Alcove the burial record shows she was aged 73 when she was buried on 24th February 1856. We note that there was a person called Elizabeth Robinson living in Back Street, Thornbury in the 1841 census. She was aged 55 and living with Thomas Robinson aged 6. Mark Williams – the 1876 rate book shows Mark Williams was in one of the cottages then owned by Charlotte Morgan. We are not sure which Mark Williams this was. Thomas Longman – the 1881 census shows that Thomas was an agricultural labourer aged 34 born in Thornbury and living with his wife, Ruth, aged 47 born in Old Sodbury. Thomas was the son of Thomas Longman, a labourer. On 6th November 1870 Thomas married Ruth Gowen in Thornbury. She was the daughter of George Gowen a labourer. The 1871 census shows Thomas and Ruth living in an unidentified house near the Seven Stars in Upper Bath Road. Living with them was Ruth’s son, Henry Gowan aged 7. The 1885 rate book shows that the other two tenants, in addition to Joanna Murphy, were John Pymm and Thomas Davis. We have no information about these to people to identify them. By 1890 William Harris Ponting had gone into coal business with Frederick William Nalder and he converted the property at the rear fronting St Mary Street into a coal depot and coach house. Even though Ponting sold the property to Josiah Bennett in 1893 he continued to let out the coal depot and coach house to Ponting and Nalder trading under the name of Thornbury Coal Company. We are not sure when it ceased being stables. We have been told that it was used for a time as a small motor garage and we do have copies of an old photograph showing a petrol pump and a sign for Castrol oil which would confirm that. 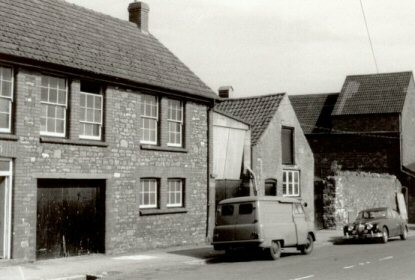 In the 1970’s we have been told that the building was used by Hubert Messenger, known locally as ‘Tubby’ who had a small hairdressing business there as well as one in Yate. Tubby lived at The Slad in Tytherington, and he and his wife, Pat, had a daughter, Mary. We also have a plan showing that in the 1990’s Tyndall Tool hire operated from here.